There is nothing easy about launching a food business. One of the biggest obstacles for starting a food business in Rochester is the high cost of setting up a commercial kitchen. The Commissary will be a resource to help you overcome that obstacle. Imagine having access to food industry-specific support services and commercial, licensed kitchen facilities and equipment only when you need it. interested in launching or growing your food business at the commissary? Tell us more about your business’ needs in this quick 4 minute survey so that we can best accommodate your needs. Aspiring food business entrepreneurs will have a one-of-a-kind facility downtown to test, prepare, market, and sell their products. A project of RDDC, The Commissary will be located on the main level of Sibley Square, and will be the only kitchen incubator facility in Upstate New York. Kitchen incubators provide the certified commercial kitchen and equipment necessary to grow a legal food business. Instead of taking on the risk of investing in expensive commercial equipment, members of The Commissary will be able to rent a kitchen station on an hourly basis - only when they need it. For more information on how it works, click here. In addition to use of the commercial kitchen stations, members of The Commissary and other would-be food entrepreneurs and the general public will have access to workshops that focus on building successful food businesses - topics will range from "Social Media for Food Businesses" to "Taking the Mystery out of Business Insurance." These workshops have already begun in a unique partnership with the RIT Center for Urban Entrepreneurship. Foodies from across our community will also have the chance to get involved! We'll be hosting cooking classes in partnership with the Rochester Brainery, chef demonstrations, pop up dinners, and other food-centric celebrations that will highlight the talents of our members and take place in the heart of our rapidly transforming Downtown Innovation Zone. The opening of The Commissary's doors is anticipated for the end of 2019. 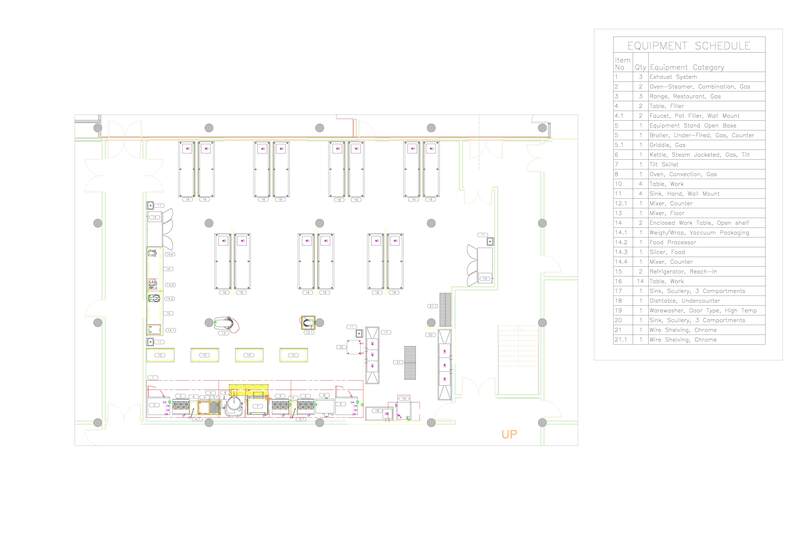 The layout has been designed by Julio Torres of BHS Foodservice Solutions. The facility will be located on the main level of Sibley Square. Check back for updates of our progress. To learn more about The Commissary and the services that will be offered, click here. If you are a caterer, baker, restaurant, or food truck owner, you must submit these permits and documents to operate as a legal business in Monroe County and within The Commissary. This type of food operation will be regulated by the Monroe County Health Department. If you are a producer of packaged food goods or shelf stable food products, you must submit these permits and documents to operate as a legal business in Monroe County and within The Commissary. This type of food operation will be regulated by the Department of Agriculture & Markets. Still not sure which Department will permit your food business? Click here. These permits and documents must be submitted in order to operate as a legal food business in Monroe County and to use The Commissary facilities. Learn more about getting a 20-C License for Food Processing, necessary for selling any packaged food products. Interested in taking your idea for a packaged food good from home kitchen to grocery store shelves? This presentation from local experts will help you get started. With one of the world's leading food science universities just down the road, we are very fortunate to have Cornell as an affordable, knowledgeable resource for food business of all scales. The CFVC provides process reviews for safety and stability of food products with focus on small and mid-sized manufacturers and entrepreneurs. For more information on different types of food goods and the regulations surrounding each, along with instructions and the required documents, check out The CFVC Guide. Still looking for more direction about what regulations your food product requires? Give the team a call at (315) 787-2280. The purpose of the Associated New York State Food Processors is to create an environment for the food manufacturing sector to be able to network with similar companies and suppliers sharing ideas and solutions for their everyday needs. The Association brings companies and individuals together that have experience and resources that enable food processors to improve their operation and explore new technologies. Norm Brown - Burch Bottle: large assortment of containers and closures perfect for condiments, syrups, honey, sauces, spices etc. If you have a 20-C license and want to sell your packaged food good in its original packaging at a farmers market, you should be able to do so without any additional licenses under NYS Department of Ag & Markets “direct marketing” policy. Click here for additional guidance. “Home Processing Exemption": a limited number of non-hazardous foods such as candy, cookies, and jams can be produced in home kitchens and sold at farmer's markets. Click here to learn more. For how to obtain a 20-C Exemption Certificate from NYS Department of Agriculture & Markets, click here. The Central Library of Rochester & Monroe County has many tools that an aspiring food entrepreneur needs to make their business a success. Their expert business research specialists can help you. Kiva is an international nonprofit, founded in 2005 and based in San Francisco, with a mission to connect people through lending to alleviate poverty. They celebrate and support people looking to create a better future for themselves by expanding access to capital for entrepreneurs around the world. To see if you qualify for a Kiva loan, click here. To learn more, attend one of their workshops! The Kraft Heinz Company has launched The Springboard Incubator Program! This program is dedicated to "nurturing, scaling, and accelerating growth" of disruptive food and beverage products. To learn more and to see if you are a good fit, click here. Deadline for the summer program is April 4th! Looking to enhance your social media presence? Feel like you don't have the time or tools to succeed? Check out this brief guide outlining easy to use resources. The Food Corridor's mission is "to enable efficiency, growth, and innovation in local food systems". On their resource page, you will find the "latest and most useful resources for the shared-use kitchen community". Listen to some experts discuss the importance of investing in entrepreneurs to help them take innovative ideas and transform them into scalable, on-trend, products. You will also learn more about common challenges faced and how supply chain investment is critical. The Commissary is a collaborative community, providing shared kitchens combined with food industry specific business assistance to help aspiring entrepreneurs build great food companies, create jobs, and strengthen our regional food economy. The Rochester Downtown Development Corporation (RDDC) is the project lead and has created a Single Member LLC to hold The Commissary, both corporations will share RDDC's 501(c)(3) status. This project is made possible thanks to our partners who are providing a variety of assets including funding, professional services, conventional business incubation services, food sector mentoring, and access to raw products for our members.